USI installs insulation in many applications. One unique market we serve is cargo or shipping containers. 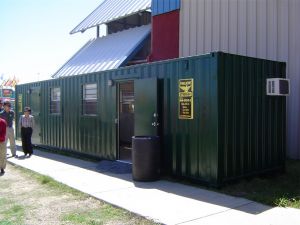 Examples of container applications are storage units, mobile offices, container homes and apartments, or survival shelters. Our branch in Mesa, Arizona had an opportunity recently to work with Stark James. 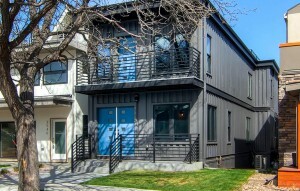 They are a custom builder who is working on container houses for a company called Containers On Grand, who re-purposes decommissioned shipping containers as apartments in downtown Phoenix. One of the photos they recently posted on their Instagram showed our spray foam rig in the frame. We sprayed 16 containers which have been converted into stacked residential apartments (2 shipping containers per apartment, making 8 apartments.) The units are all permanently in place, about to be sheet rocked. USI is installing 1.5” of closed cell spray foam at all metal walls and ceilings, then adding full fill fiberglass batts to metal studs framed for walls and ceilings. These are all units to be rented out as apartments. We’ve also had a couple occasions in the past where local oil/drilling companies inquired about spraying closed cell foam in and under containers being converted to work stations in a northern climate. A few years ago, USI completed a job for Red Hill Construction who builds living shelters out of containers. They also do mini-storage and self-storage facilities. USI Chase Insulation in Austin, Texas has also installed spray foam insulation for Falcon Structures. Large, commercial construction companies use these to build mobile offices on construction sites where the project lasts more than 36 months. Sarah Voight, Sales Rep for USI Chase Insulation, said she was just asked to bid on two mobile office projects – one residential and one commercial. For the shipping containers, USI bids by project and with closed cell foam. Check out some other great things Falcon Structures is doing by visiting them on their Twitter page. 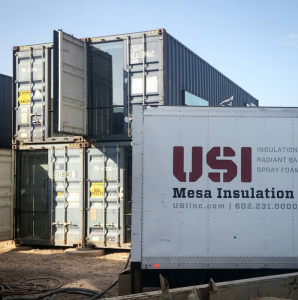 For more information on how you can incorporate insulation into containers, contact USI online to get a quote. USI believes that excellence in every step of the process ensures timely completion and quality service, time after time. How long does it take for spray foam to dry? ← How Do I Know If I Need More Insulation?